Brad McNamara in the Freight Farms container by the Clark Recycling Center. 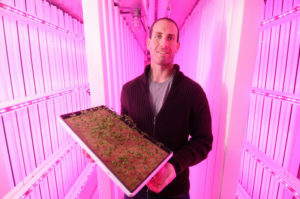 I’m terrible at growing things,” laughs Brad McNamara, MBA/ES&P’13, as he holds a tray of basil sprouts. He’s being modest. The sprigs look healthy enough, and McNamara already has produced a harvest of perfectly edible lettuce. NPR’s “Here & Now:” Listen and read more about McNamara’s company. McNamara is standing inside a shipping container lined with rows of vertical “growing towers” bathed in pink glow, the result of the red and blue LED lights that substitute for the sun’s rays. Nutrient-rich water is piped into each tower, and the temperature inside the room remains at a moderate 65 to 75 degrees. All of it is controlled by computer via wireless connection, and the conditions inside this rig can be adjusted remotely from just about anywhere in the world. McNamara may question his ability to grow veggies, but he certainly knows how to cultivate a business. 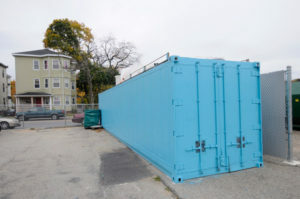 He and partner Jon Friedman have launched Freight Farms, beginning with the prototype parked in the lot behind the Clark University Recycling Center. The men are pioneering this unique growing method that blends the principles of hydroponics, high technology and sustainability to produce a steady harvest of leafy greens and herbs. And while McNamara is excited that the vegetable output has been robust, he and Friedman have their eyes on another type of green. They’ve been wooing investors, including one from Japan who spent a recent weekend with them, to build Freight Farms into an international company. The Freight Farms prototype, located in the lot behind the Clark Recycling Center. “We’re not in business to sell produce,” McNamara says. “We’re selling a farming platform.” A Boston-based food distributor has already purchased a Freight Farm; the platform is trademarked and McNamara and Friedman have provisional patents on the processes. “Our overarching goal is to allow anyone to grow food anywhere,” McNamara says. “People can run a Freight Farm as a business, and they can become food distributors in their own neighborhoods.” These stackable greenhouses can be situated wherever there’s the space to accommodate the 40′ x 8′ x 8′ trailer and the electricity to make this indoor farm hum. McNamara is enrolled in Clark’s dual degree program, pursuing a Master of Science degree in Environmental Science & Policy from the International Development, Community and Environment (IDCE) Department and a Master of Business Administration from the Graduate School of Management (GSOM). He says he and Friedman want to partner with government and non-government groups conducting food programs. The floor-to-ceiling towers (envision a cross between a vertical blind and a gutter guard) accommodate a staggered growth cycle, so that plants are in various states of maturation. The seeds are first planted in tiny cubes of recycled non-organic matter known as rockwool — when assembled side by side in a tray, the cubes resemble brownie batter. As they bud, the sprigs are then transferred into a strip of rockwool that is inserted into a tower. From there, the LED lights — combined with nutrient-rich water that is recirculated through an irrigation system — have allowed McNamara and Friedman to grow 3,000 plants simultaneously since the Freight Farm went online Aug. 15. Among the customers for their produce is The Local Root, the food co-op run by Clark University students. The veggies have been popular, and the co-op has put out a call for Swiss chard. “We’re determining the best mix of plants to grow,” McNamara says. He notes that each Freight Farm is outfitted with six to eight cameras, and expert growers hired by McNamara and Friedman will be able to monitor progress remotely and do trouble-shooting for every Freight Farm from a central control site. So for instance, if a Freight Farm owner notices a fungus on his plants, a camera can zoom in on the fungus and the expert can make a diagnosis and offer a plan of action to deal with it. McNamara told the CLARK alumni magazine that his vision to help repair “the broken food system” is “to create sustainable, local food economies around the globe.” The investor from Japan, for instance, is keenly interested in Freight Farms, he says, especially for use in areas that were affected by radiation from the Fukushima Daiichi nuclear disaster following the March 11, 2011 tsunami. McNamara and Friedman held a grand opening ceremony for Freight Farms on Nov. 3, behind the Clark Recycling Center, which was attended by, among others, Congressman James McGovern. The partners, who solicited early investors through a Kickstarter account, are now pitching their business model to venture capitalists.